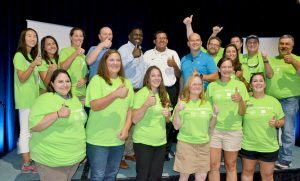 Opening day of the Farm Progress Show, Bayer and the National 4-H Council announced a new partnership for future innovators in science and technology to help feed a growing population. The nationwide collaboration, Science Matters, is designed to address the need for an enhanced STEM (science, technology, engineering and math) workforce by planting a love of scientific exploration in young people around the nation. Alumni of the youth organization within Bayer joined to celebrate the announcement. “The ability to reach out to youth across America and have a conversation about science and its connection to food and agriculture, there really is no better partner than 4H,” said 4H alum and Bayer North American Vice President of Communications Darren Wallis. “In 4-H, we believe in the power of young people, and we are thrilled to join with a company like Bayer that also sees the potential when you equip youth with the skills and opportunities they need to be true leaders,” said Artis Stevens, Senior Vice President and Chief Marketing Officer, National 4-H Council.